Its getting close! Less than a week until Christmas! 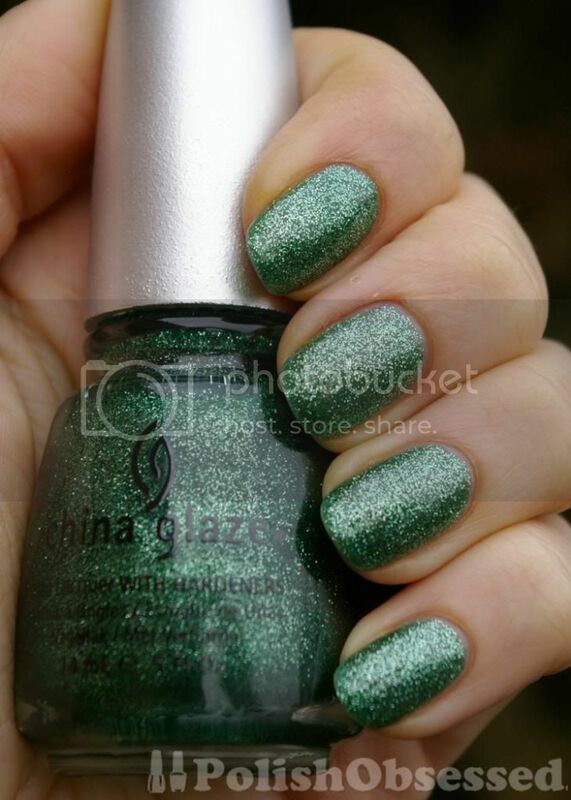 Today I have a Christmas themed polish from one of China Glaze's last holiday collections, Mistletoe Kisses. This polish is a bright green jelly base packed with silver glitter which appears to be mostly green due to the green jelly base. This polish applied amazingly, super smooth and even, in my photos I only used two thin to medium coats. I love the sparkle and shine of this polish, it's festive and pretty, I really love it. It reminds me of a few other polishes that are similar in formula and finish but are a different shade. Skyscraper - an indigo jelly with silver glitter. All three of these polishes from china glaze, and only Mrs. Clause and Mistletoe Kisses were apart of the winter/holiday collection. Skyscraper, in my opinion, could have easily fit in with the Christmas/holiday theme. Out of the three Skyscraper is my favorite, however Mistletoe Kisses comes in at a close second! Mrs Claus is one I bought maybe 3-4 yrs ago and did not 'get it' then. It was so not a traditional Christmas shade. Now that glitters are so popular, I end up using it a lot outside of the holiday season. And yes, someone else showed Skyscraper as a back for a night sky nail art scene and I thought right on! I am going to pull mine to see what I can come up with my limited nail art skills. I love nail polish ... obviously :) it makes me happy and I love collecting them, old and new! GIVEAWAY -- Hobby Polish Bloggers' Winter Giveaway! $200 Grand Prize, Two $100 Runners Up! Beauty Blog by Lisa - TIPS from head to toe! Nails by Arie E., Alliance OH, Nails Alliance OH, Nail salon Alliance OH. Simple treatments: bad doctors or a bad health system? My Little Pony: Friendship is Magic manicures! Nailene Girls - We are Back! Blogger Changing Name to "Google Blogs"? China Glaze Crackle Polish "Fault Line"
Back from a long break with a stash tour! Diary of The Original Swedish Blonde!